It is possible to change the figure of reflecting surfaces quantitatively by controlled deposition of metals, evaporated in vacuum. The theory for calculating screens and the experimental technique are described. A spherical 12-inch mirror has been repeatedly parabolized, obtaining a surface perfect within 0.05 wave-length. 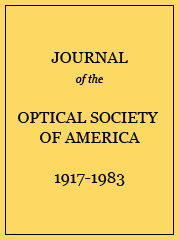 A 558‐inch spherical mirror has been parabolized with the optical axis outside of its periphery. A defective parabolic mirror was corrected for turned up and down edges. A convex spherical secondary mirror was hyperbolized. The limitations and possible applications of the method are discussed.